The GLCDlib library for the Graphics Board has been extended to support multiple fonts! If you look closely, you’ll see that even kerning has been implemented – making italics much nicer. The main use I see for this is not so much about going overboard with all sort of “roman”, “italic”, or “bold” mixes (although now you can), but to mix different font sizes on the same screen (large values, small labels, etc). To use a font, include the proper header in your sketch, and call glcd.setFont() to activate it. The thing to keep in mind is that fonts use up flash memory space. I’ve come up with a fairly compact way to store them, but larger fonts obviously need more memory than tiny ones, especially if they include all ASCII character codes. Also, proportional fonts need more space than mono-spaced fonts, due to extra per-character width / offset info. 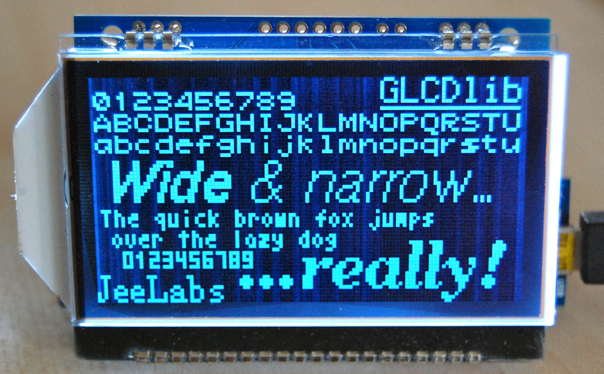 The above sketch compiles to 12572 bytes, of which about 8 Kb are fonts. One last note: these changes mean that you now always have to set up some font before calling drawChar() or drawString(), there is no default (it might not be the one you want, or you might not need any fonts at all). Superb work there Mr W! Who says so? Can’t big foxes jump? nice work ,even 4×6 is good readable. Ok, ok. Another round tomorrow!